If a fleeting moment becomes suspended, like dust is suspended in sunlight, what happens to movement? If movement is counter-acted, like two forces moving in opposite directions, what happens to the fleeting moment? If one reels past the other, and the other reels past one, how can we extend the time in which we meet in the middle? How can we reveal that which cannot be placed in time? Jazbo Gross Received his MA in Contemporary Art Practice, with a Moving Image Pathway, from the Royal College of Art, in 2017. He works with video, installation and performance is informed by the unwritten rules, codes and scripts (i.e. dumb things) embedded in social practices and technology. Recent exhibitions include Intimaterial, Royal College of Art, London, 2017; P.P.S. Tall Tales, Joshua Leon and Adam Glibbery, London, 2017; Memememe, Crypt Gallery, London, 2016; Disappointment Gala, Fountaine Rd. Studio, London, 2016; The Campaign, Subject Matter Art, Dyson Gallery, 2016; Guardian Windows, Windows187, London, 2015; showbisse.dk, Øen CPH, Copenhagen, 2015; FOKUS, Nikolaj Contemporary, Copenhagen, 2015. Luli Perez Graduated from the Royal College of Art after completing an MA Print Programme, with Performance Pathway, in 2017. She works with live experiments in which she uses metaphors of key cognitive elements used in the process of producing creative outputs. These usually being duality and opposition, perspective, focus and framing, locations, and the duplication or replication of them. A selection of shows includes Follow, Lychee One gallery, London, 2016; Performance Art Meeting Poznan-London, Labirynt Gallery, Lublin, 2015; Les Pies Poudres, Yia Art Fair at Le Carreau du Temple, Paris, 2015; In The Moment of Doing, Testbed 1, London, 2015; Out of That Forest, Kottinspektionen gallery, Uppsala, 2015. 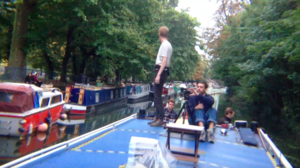 For approximately 10 minutes, on the evening of Saturday, 30th September, 2017, on the deck of the MV Challenge - a narrow 12 metre vessel cruising Regent’s Canal in London - we set ourselves along port and starboard, facing outwards, to reach out and arrest time between our points in space and those of the other we encountered when moving past. Filming from our centres of gravity and not attending to the cameras, we recorded this mapping of space and arresting of the moment before it became the moment past. These are documents of this process. A boat that doesn't travel to a final destination; travelling without reaching an end, travelling for the sake of being in motion — whatever our attempts at holding on to something, of capturing, there is a world that sets a boundary to the possibility of capturing; a world that is moving. Why should we make maps when the map is not the territory? Why would we trace a map of a territory that can never be revisited? What purpose can we ascribe to this spontaneity? Is, perhaps, the act of mapping is in itself worthwhile and the encounter everything? In meeting with otherness, where are we going when we work relentlessly towards standing still? 1 Bapor Tabo(o) is the title of the show in which this piece was performed. Curated by Linda Rocco and Rhine Bernardino, the title references Philippines’ symbol used in novels during the Spanish colonisation to depict the extremism of social strata where the higher classare at the top and the lower class are at the bottom; Bapor Tabo translates literally as boat dipper. As such, the curatorial idea was “an avenue to address the divide and highlight issues of accessibility and exclusivity, inherent in viewing or consuming art and culture”1. The destination-less movement back and forth between locks renders itself as a platform that reaches a contingent audience, rather than expecting the audience to reach the show.